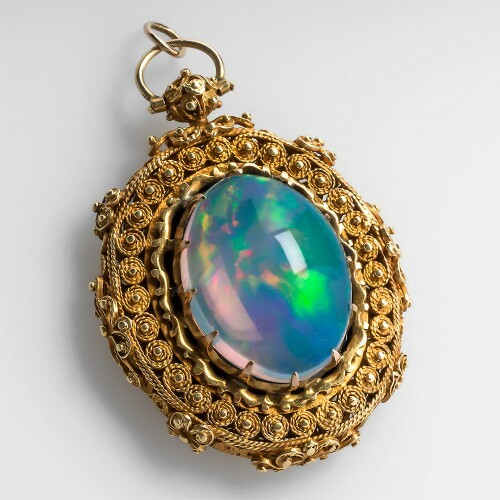 This magnificent jelly opal locket pendant was crafted in the Late Victorian Era. A detailed ornate frame, featuring Old World granulation technique with scrolling golden cords, houses a prong-set jelly opal crystal weighing greater than 20 carats. Mounted on the back, in a removable photo frame, is a black onyx tablet engraved with a love note from Joe to Nancy. Opal has been the stone of choice for chiefs, kings, queens, and other royals throughout the ages. Ancient Romans believed opals brought good fortune. They wore opal as a symbol of hope and purity and believed that the stone protected them from sickness. The ancient Greeks wore opal to enhance their mystical powers of prophecy and foresight. Aborigines believed that opals were the rainbow footsteps of the Creator. They believed the Creator descended to earth on a rainbow road, bringing a message of peace to mankind. Wherever his foot touched the ground, the rainbow crystallized into a opal stones, allowing man the opportunity to hold divine love and affection in his very hands. Ancient Arabs believed that lightning had become trapped in the layers of opal, infusing it with a powerful play of colors. They believed that wearing opal would render one invisible. Ancient Indians also believed opals were a form of divine rainbow. In their case, they believed the Goddess of the Rainbow had fallen to the ground after being turned to stone. These references to rainbows and lightning are no surprise. The play of color in an opal is absolutely mesmerizing. All the colors visible to the naked eye are accounted for, in some stones more than others depending on the variety and size of the opal. Crystal healers and mystics believe that opal continues to harness divine power. It's play of color inspires lightness of heart, joy in the moment, and pure happiness. It is associated with flashes of intuition and is believed to heighten even the most mundane of experiences. It is believed to promote spontaneity and playfulness and is thought to enhance self-esteem and allow a person to express who they truly are. Opal is thought to foster love, passion, warmth, enthusiasm, and creativity. It is said that wearing an opal jewel can soothe your mind, aid in transformation, give you happy dreams, release inhibitions, and drive away your fears. Wearing an opal can also inspire loyalty, faithfulness, and warmth, leading to greater levels of trust and intimacy with those you are closest to. If you'd like to experience the power of opal in your own life, we invite you to make an appointment to meet with one of our specialists who can show you a wide variety of opal jewelry to meet your needs.